Bas-Congo province Member of Parliament Yves Kisombe was expelled from the Movement for the Liberation of Congo (MLC) on Thursday. He had taken positions which went against the party line, In March, he distanced himself from the position of the MLC during a debate in the National Assembly on the actions of the government against the Bundu Dia Kongo (BDK) political and religious movement in the Bas-Congo province. An inquiry was launched by the leaders of the party and a disciplinary commission was put in place to decide his fate. The commission recommended that he should be expelled from the party. The MLC, led by its Secretary General Francois Mwamba, also a Member of Parliament, said it will now ask the Supreme Court to strip Yves Kisombe of his seat in the National Assembly. However it is unclear if the Supreme Court has the authority to force him out. A provision of Article 110 of the Constitution states that a Member of Parliament can lose her or his seat if she or he voluntarily quits her or his party. The leader of the MLC, Jean-Pierre Bemba, had also asked for his expulsion after what he called the ?cut-throat? 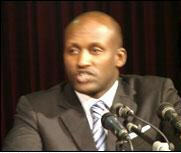 positions taken by Yves Kisombe on behalf of the MLC during last month's debate on the BDK. Jean-Pierre Bemba may soon also be expelled from the Senate because of his prolonged absence from the Upper Chamber of Parliament. He has been in exile in Portugal since leaving the country in April 2007 after his soldiers fought against President Kabila's guards on the streets of Kinshasa in March 2007. The government has since said it intends to charge him with treason. The MLC has asked for a political solution.